Here is GTransition plugin for Panotour. Information about GTransition plugin for krpano can be found on this page. GTransition - is a plugin for Panotour, which add transitional effect in the style of Google/Matterport (walk-through transition effect). The plugin will work correctly only in virtual tours in which all panoramas are properly oriented relative to the North (KEEPVIEW'ed virtual tours). 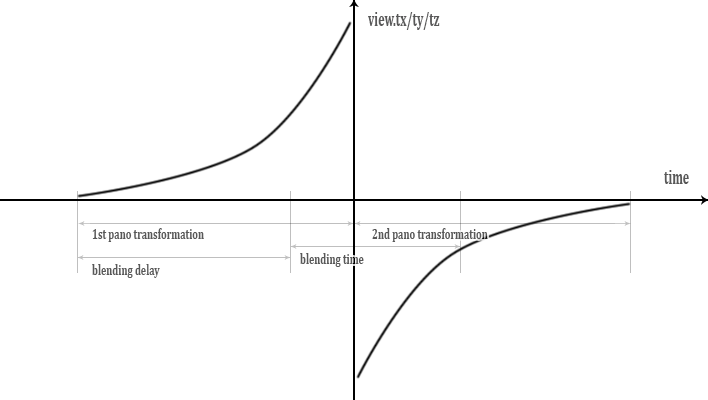 In KEEPVIEW mode, the beginning of one panorama into another stops any transformations of view, so if Blending delay is zero, then the current panorama is replaced by the transforming second, if Blending delay is equal to Transition speed, the current panorama is first transformed and then replaced by a static second. By selecting the duration of blending panoramas and the delay time before it starts, you can achieve different transition effects. Obviously, when using KEEPVIEW|KEEPMOVING, the behavior of the plugin will change. The maximum duration of the transition effect is Transition speed * 2 seconds. In the Panotour Style tab settings set Target and Source transition to None for hotspots you are using in your project. This is required! If you are using GArrows plugin in your project you need to disable KEEPVIEW in the GArrows plugin settings! This is required! 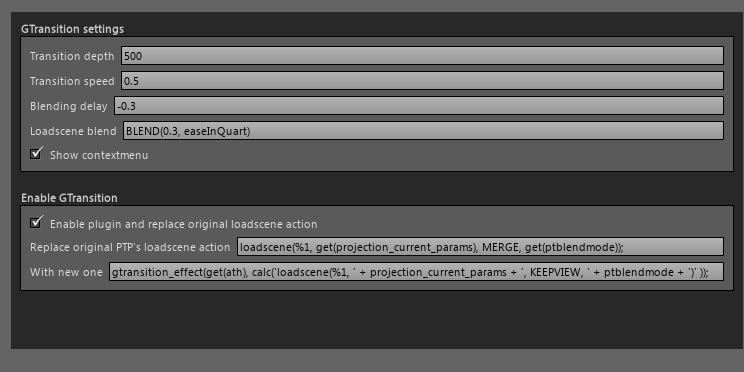 If the plugin does not work, open "yourproject"_core.xml file, find <action name="mainloadscene"> action, copy string starting with loadscene(...); and paste it into "Replace original PTP's loadscene action" field in the GTransition plugins settings!!! Fully functional trial version of the GTransition plugin for Panotour can be downloaded here.